I’ve been struggling with how to write a review of Marvel Studios’ recently released Avengers: Infinity War without giving away the plot. That is really tough to do, since the dramatic ending sort of blindsided many of us in the audience. Avengers: Infinity War is obviously a set up for next year’s heavily promoted next episode in the Marvel Cinematic Universe. But it seems more like The End, with super heroes disappearing all over the universe. Ten years in the making, the film goes on a little longer than most non-fan-boy types (ordinary people like me and my husband) can appreciate. However, it certainly lives up to its billing as the “deadliest showdown of all time” and features a villain everyone will love to hate in the monstrous Thanos (Josh Brolin). Thanos is single-mindedly focused on destroying half the occupants of the universe. This includes most of the super heroes we’ve come to love, even to the point of hoping they would be around for many more movies and comic book episodes. The action veers at a dizzying pace from various dimensions and galaxies to space ships to Wakanda to D.C. Viewers need to stay focused to keep up (unless of course you have read every single comic book in the Marvel universe from cover to cover and memorized most of them). 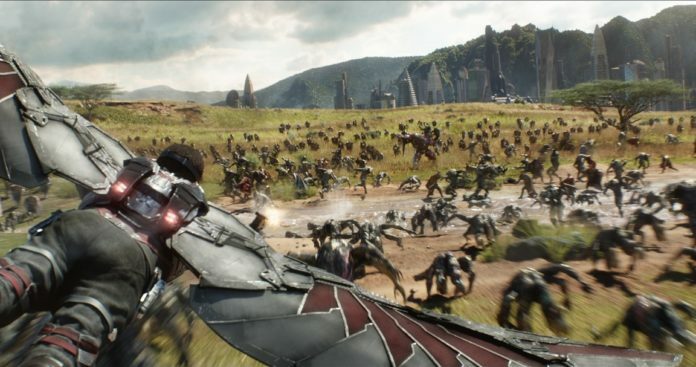 It includes way too many super heroes: Thor (Chris Hemsworth), Iron Man (Robert Downey, Jr.), Hulk (Mark Rufalo), Captain America (Chris Evans), Black Widow (Scarlett Johansson), War Machine (Don Cheadle), Doctor Strange (Benedict Cumberbatch), Spider Man (Tom Holland II), Black Panther (Chadwick Boseman), Gamora (Zoe Saldana), Nebula (Karen Gillan), Loki (Tom Hiddleston), Vision (Paul Bettany), Scarlet Witch (Eliabeth Olsen), Falcon (Anthony Mackie), Winter Soldier (Sebastian Stan), Groot (Vin Diesel), Mantis (Pom Klementieff), Drax (Dave Bautista), rocket (Bradley Cooper), and Star-Lord (Chris Pratt). Just trying to recall who they are and what powers they have can be confusing, unless of course you are one of those ultimate fan boys or girls mentioned earlier. Infinity Wars is a series of somewhat connected stories with characters who don’t often interact with each other. Avengers: Infinity War is an action/adventure/science fiction/fantasy film directed by Anthony Russo and Joe Russo, and written by Christopher Markus and Stephen McFeely. Produced by Walt Disney Pictures, it runs 156 minutes at local theaters….and theaters all over the universe. Rated PG-13 for intense sequences of sci-fi violence and action throughout, language and some crude references. We saw a screening at the plush new Alamo Draft House at Toyota Music Factory in Las Colinas. Also in the audience were several True Fans (most of them had already seen several earlier screenings) who loved every minute of the 156. Most would have happily stayed even longer. Of course, that could be thanks to the extensive menu at this new Alamo Draft House. Plus some very crafty cocktails at the Vetted Well. The Alamo Draft House team works hard to make going to the movies—even really long movies– a night to remember!